In most of the Fire Emblem games, there was a great battle that took place hundreds of years before the beginning of the game. A few of the elite fighters who fought in the war were remembered as heroes. None of the games really told us much about these heroes, but most of what we do know can be found here. Just over a hundred years ago the tyrannical Dolunian Empire, led by the Shadow Dragon Medeus, ruled the continent of Akaneia. Mankind fought back to the death, but they were powerless against Medeus’s overpowering might. 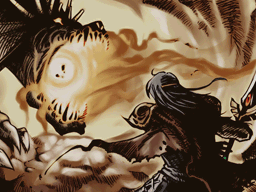 In the end, a miracle occurred as Anri defeated Medeus with the divine Falchion sword and ended Doluna’s reign. Marth’s ancestor; the legendary hero who slayed Medeus and brought peace to Akaneia. Anri was in love with Akaneia’s princess Artemis, but could not marry her since he was a peasant. Later, he founded the Kingdom of Altea, ruling it as its king. Due to his undying love for Artemis, Anri never married nor had children; after his death, Altea was succeeded by his younger brother Marcelus. Anri’s weapon, the Falchion–which he obtained after a treacherous journey–was kept at Altea until Gharnef took it by force. The leader of Akaneia’s liberation army, who received the Fire Emblem from Akaneia’s princess Artemis. Cartas received immense support from the citizens and even started turning the table against Doluna. However, his winning streak ended as soon as Medeus entered the battlefield. After the Dolunian Empire fell, Cartas married Artemis and ascended as king of Akaneia. His younger brother Marlon became the first ruler of Aurelis. Known as one of the Three Heroes of the War of Liberation, alongside Anri and Cartas. Ordwin, a veteran Akaneian general, was the leader of the garrison situated at Grust. He eventually conquered the barbarians of Grust with his mighty knights and founded the Kingdom of Grust. Originally a slave sent to the underdeveloped forests of Medon to work for the Dolunian Empire. 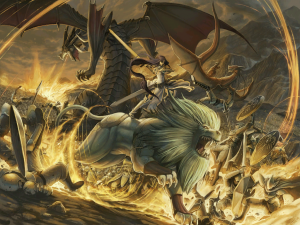 Iote could not tolerate the harsh conditions that the slaves worked under, so he and his companions fought, riding airborne Wyverns, to liberate the slaves. Following Doluna’s fall, Iote was encouraged to become the first king of the newly founded Kingdom of Medon. Deghinsea is the current king of Goldoa, the realm of dragons, and the only surviving member of the three heroes. Perhaps from his experiences, he constantly warns the other Laguz kings not to fuel conflicts while Lehran’s Medallion exists. His son is Kurthnaga, a gentle and kind youth who helps Ike’s group cross the seas of Kilvas. Later it is revealed that Deghinsea was the one who created the Dark God myth, to prevent the people of Tellius from warring and thus awakening the slumbering Ashera. A Beorc woman who fought the Dark God’s army with her two goddess-blessed blades. Altina later founded the Kingdom of Begnion and became its first Queen. Her original husband was Lehran, of the Heron tribe, and she bore a child with him. However, after it was discovered that Beorc and Laguz interbreeding led to the creation of the Branded, her child was raised by a Beorc husband instead. Her descendants are Sanaki, the current ruler of Begnion, and Micaiah, the Priestess of Dawn. A Lion warrior who became the second King of Begnion, following Altina’s rule. Not much is known about him, although it is strongly implied that Stefan is his descendant, due to his similar Japanese name of Soanevalcke and ending title of “Lion’s Descendent” (in the Japanese version). Some 800 years ago, five heroes fought the Demon King with the aid of the Great Dragon and sealed the Demon King away using five Sacred Stones. This is one game that is severely lacking in information about the heroes, especially since only two of the heroes are ever named. Likely class: Perhaps a Hero that can use Dark magicThe Hero Grado was the leader of the five heroes and later founded the Grado Empire. His descendants include the current emperor, Vigarde, and the imperial prince, Lyon. St. Latona founded the theocracy of Rausten. She is the ancestor of L’Arachel and, her uncle, the pontifex Mansel. According to legends, she was the only human able to fend off the Demon King’s evil possessive grip. Like Hanon of the Eight Legends, the English version incorrectly refers to her as a male. A millennium ago, there was a huge war between humans and dragons known as the Scouring. Mankind eventually won this battle, mainly thanks to the efforts of eight warriors. These eight warriors became known as the “Eight Legends” (or “Eight Divine Generals” in the Japanese version) and their weapons became known as the “Divine General Weapons” (sometimes referred to as just “Divine Weapons”).Note: Many of the suggested classes are based on the classes of the bosses that guard each Divine Weapon in Binding Blade. For example, the boss that guards Durandal is of the Hero class. This reasoning might sound strange at first, but you’ll find that most of the classes will match up quite nicely. Roland was the founder of the League of Lycia and ancestor of many Lycians, including Eliwood and Hector. In Blazing Sword, Eliwood meets the spirit of Roland when he undergoes the trial to obtain Durandal. During their meeting, Athos refers to him as the “little knight” (“little hero” in the Japanese version). Barigan was the founder of Ilia, which is slightly ironic seeing as its now mostly woman-dominated. His most likely class is not General (the class of the boss that guards Maltet), because he is depicted riding a horse. After the Scouring, Durban settled down at the Western Isles. When Hector undergoes the trial to obtain Armads, he meets the spirit of Durban who refers to himself as “Armads” like his weapon. Durban allows Hector to wield his power, but warns him that such power comes with a cost. 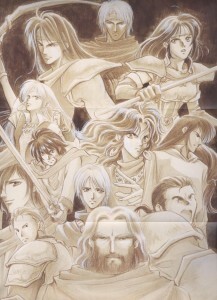 Hanon was the founder of Sacae, and the ancestor of nomads such as Lyn. It should be noted that the English version of Blazing Sword incorrectly refers to Hanon as a male. In Binding Blade (and the Japanese Blazing Sword), it is stated that Hanon is a woman. Five hundred years after the Scouring, Athos met Nergal at the Nabata desert and together they stumbled upon the hidden village of Arcadia. Upon discovering that Nergal was using the knowledge of dragons for evil, Athos joined forces with the divine dragons and banished Nergal from Arcadia. 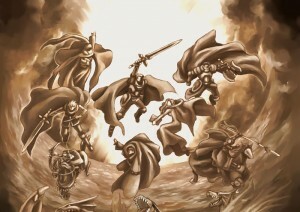 Athos appeared in Blazing Sword, helping Eliwood and Hector fight the Black Fang. At the end of the game, however, he finally perishes and it is assumed he was buried at his home of Nabata (or at least they took his magic tome back there). St. Elimine founded Etruria and the predominant religion of the continent. It is said that upon her death she ascended as a goddess, while her body was laid to rest at the Tower of the Saint constructed in Etruria. When you link up Blazing Sword to the Mario Kart: Double Dash!! bonus disc (on the GameCube), St. Elimine appears and grants exclusive and rare items to your game files. She also wielded the Saint’s Staff, which is not a Divine Weapon despite it being an S Rank staff. Bramimond gave his soul to Dark (or what some call “elder”) magic and as a consequence he mirrors the personality of those who speak to him. Like Athos, he survived the Scouring and took up residence within the Shrine of Seals in Bern. However, after Athos requests for Bramimond to release the seals on the Divine Weapons, Bramimond states that he will soon go to sleep. Hartmut was the leader of the Eight Legends and later founded the Kingdom of Bern. Hartmut’s Divine Weapon was Eckesachs, a powerful blade passed down by the rulers of Bern. He also wielded the Binding Blade–a weapon even stronger than the Divine Weapons–which he used to defeat the leader of the dragons. To his surprise, he found the leader was just a young dragon girl being manipulated. He defeated the girl, Idoun, but did not kill her- only sealing her away within the Dragon Temple in Bern. A few hundred years ago, the evil Loputo Empire ruled the lands. When it seemed all hope was lost, twelve gods descended at Darna and gave their power to twelve warriors. These warriors, known as the Twelve Crusaders, went forth to crush the Empire and form twelve kingdoms or dukedoms. Each Crusader has their own bloodline named after them (except for Heim) and a Holy Weapon that can only be used by their direct descendants. Notes: Dain and Noba were siblings. Sety should not be confused with Holsety, who was the Dragon God that gave him his powers.